The 2018 Hyundai Verna is expected to bear many of its elements from the more expensive Elantra. 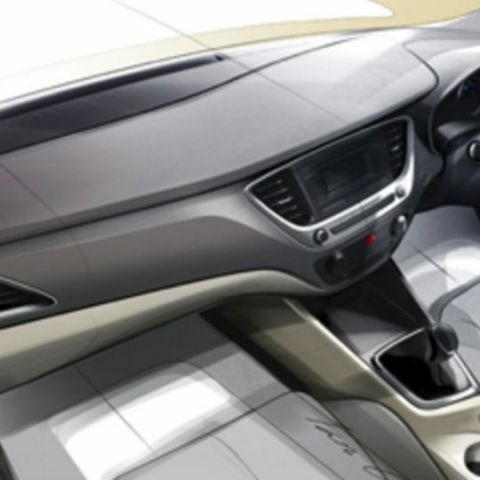 Hyundai is gearing up to launch its new generation Verna in India, and has teased a sketch of the interiors across the Internet. The 2018 Hyundai Verna was initially unveiled as a concept back in the 2016 Beijing Auto Show, and with the latest teaser, the C segment sedan is expected to be closer to its launch date. Hyundai India posted the teaser link on its Facebook account as well, suggesting that the car will come to India soon. The all-new Hyundai Verna is expected to bring with itself a facelift from the present Fluidic design language that makes it look a lot like the present generation Hyundai Elantra. The Verna is sold in the Russian market as Solaris and in Canada as the Accent, both of which were exhibited as production-ready models. In India, however, the Verna will retain its existing moniker and add a host of design and technology upgrades. Notably, the in-car infotainment system is slated to get a significant upgrade with support for both Android Auto and Apple CarPlay, as we have already seen in both the 2017 Elantra and Grand i10. It is also expected to include an integrated navigation system, and upgrade its interiors to now include soft touch plastic inserts and better overall quality of interiors. The air-conditioning unit, as it seems on the sketch, resembles the simplistic look of the Grand i10's, and in all possibility will be understandably not getting the dual-zone air conditioning of the Elantra. On the exterior, the Hyundai Verna will now resemble the Elantra to a large extent with the new grille cluster and sweeping lines along the body. The new sedan will be slightly longer and wider, while retaining more or less the same weight, while should technically improve the space inside as well as the car's handling. Hyundai is going for a more luxurious appeal along with improved driving dynamics of the car, and the 2018 Hyundai Verna will be up against the likes of the new Honda City, Maruti Ciaz and Skoda Rapid when it launches in India.